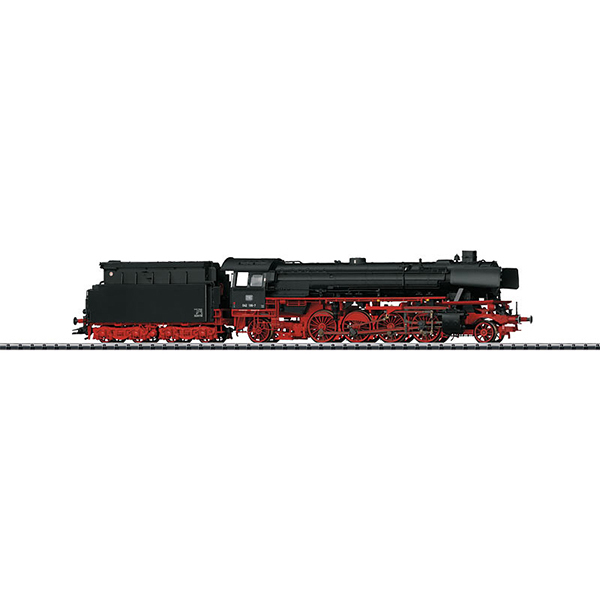 Prototype: German Federal Railroad (DB) class 042 oil-fired freight train steam locomotive with a tender. Rebuilt version with a new design, high-performance boiler, Witte smoke deflectors, DB reflex glass lamps, inductive magnets on both sides, buffer plate warning strip, and rebuilt tender with an oil bunker. Road number 042 186-7. The locomotive looks as it did around 1972. Model: The locomotive has a 21-pin digital connector. It also has controlled high-efficiency propulsion with a bell-shaped armature and a flywheel, in the boiler. 4 axles powered. Traction tires. The locomotive and tender are constructed mostly of metal. A 7226 smoke generator can be installed in the locomotive. The triple headlights change over with the direction of travel. The headlights and the smoke generator, which can be installed in the locomotive, will work in conventional operation and can be controlled digitally. The headlights are maintenance-free, warm white LEDs. There is a close coupling with a guide mechanism between the locomotive and the tender and it can be adjusted for curves. The back of the tender and the front of the locomotive has a close coupler with a guide mechanism and an NEM coupler pocket. Minimum radius for operation is 360 mm / 14-3/16. Piston rod protection sleeves and brake hoses are included. Length over the buffers 27.5 cm / 10-13/16. This model can be found in an AC version in the Marklin H0 assortment under item no. 37926.